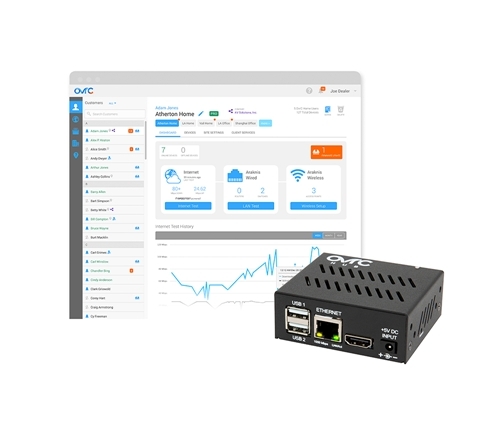 OvrC Pro extends your visibility and access to the entire network of IP devices, including non-SnapAV products, all within the same OvrC platform you love. With OvrC Pro, you get access to enhanced troubleshooting capabilities and diagnostic data that makes remote support easy, eliminating unnecessary truck rolls and enabling you to provide world-class service to your clients. To stay up to date on the latest OvrC features and functionality, check out our blog. Get access to the Location Dashboard view, which displays a quick snapshot of a location’s system health for vital troubleshooting clues. Device Status – View the number of online and offline devices, including SnapAV products and any Hub-found devices you choose to monitor. Firmware Updates – See available firmware updates for SnapAV products. Network Tools – Run an ISP internet test manually, check the latency of all products on the network, or quickly set up a new Araknis WAP SSID. ISP Internet Test History – View ISP performance over time. Araknis Router DHCP Client – View all DHCP clients on the network, along with its status and associated IP address. Reserve IP addresses with a click of a button. Araknis Wireless Client List – View all wireless clients at the location, as well as signal strength, associated SSID, radio interface, and Tx/Rx values. Built-in Network Diagnostic tools allow you to better recognize ISP speed trends and understand the source of the network latencies, to identify whether the issue is internal or external. ISP Internet Test – Run manually or automatically on a schedule to see trends. Measures download speed, upload speed, and latency. We leverage Ookla’s latest Speedtest.net technology to derive results. Traceroute Analysis* – View the communication path from the Hub to any service or device inside or outside the network, along with the response times between hops. This helps determine the source of network latency (internal or external). Ping Test – Ping IP addresses on the network to see device response times and packet loss on the local network. Once installed, the OvrC Hub automatically finds all IP devices on the network, relaying relevant device information to OvrC and regularly pinging their online status. General Device Information – View device name, online status, MAC & IP address, manufacturer, latency, first seen and last seen time stamps. Open Ports and Services – Scan available ports and the associated services, including HTTP, HTTPS, Telnet, SSH, and any other port/service combination that you define. See Advanced Remote Access section for more info. SNMP Information – See standard networking device information, including name, description, contact, location, uptime, and a list of any network interfaces with its associated connection speed, state, and in/out data stats. ONVIF Information – ONVIF is a standard camera protocol that allows dealers to view video stream URLs, camera snapshots, user list, and firmware versions on compliant hardware. Soft reboot the device for some select devices. (Capabilities may vary based on what is exposed by the manufacturer via ONVIF). PJLink Information – PJLink is a standard protocol for operating and controlling compliant LAN-capable projectors. Reboot projectors and see status information for inputs, volume, errors (lamp error, power, etc. ), and lamp (status, hours). Multiple VLANs Support – Set up the Hub to scan and monitor IP devices across multiple VLANs. With the click of a button, you can designate specific devices to monitor. If the Hub doesn’t receive a ping response from a device within 10 minutes, you’ll be notified. Online/offline Notifications – Receive email and push notifications when the device you are monitoring goes online or offline. For manufacturer-specific device information, see the “Product Integration” section. The Hub automatically scans available ports and the associated services on devices and makes them accessible with a click of a button, all without port forwarding, VPN, or any other network setup. Web Connect (HTTP/HTTPS) – When available, securely access the local web UI of any supported device remotely for deeper configuration and control. Console Connect (SSH, Telnet) – Establish a secure SSH or Telnet connection to any supported device for enhanced diagnostics and troubleshooting. Product-Specific Capabilities – Additional information and capabilities are available for a growing list of non-SnapAV products (see Product Integration section). Application Protocols – Establish a raw socket connection through any port on your device and third-party software through a secure URL. Examples include: connecting to a computer onsite using Remote Desktop Protocol (RDP) or VNC, programming Crestron devices, accessing RTSP/H264 video streams, or any other single-port application. For any of these non-standard ports, you must configure the Hub to scan the specific port. See the Videos tab to learn how to do this. View processor memory and CPU usage, network details, Zigbee device names derived fromComposer and Zwave device details, including state, battery level, and signal strength. Soft reboot the processor without having to install a driver in the Control4 system. View processor name, version number, network details, hardware and system details. Soft reboot the processor without having to install a module in the Crestron processor. View processor information, memory and CPU usage, network details, and soft reboot the processor from OvrC. This requires the installation of the OvrC driver on the URC processor. You can find the OvrC URC driver in the Support Tab. View brand, model, version, and outlet status. Reset outlets or turn them on/off. Control PoE outlets on non-SnapAV switches via SNMP. View the full list of compatible switch models and capabilities in the Support tab. View device details such as model, version, room name along with more advanced troubleshooting information, including port stats, topology, controller states, radio logs, etc. In addition, soft reboot the device. Turn the device on/off, factory reset it, view firmware version, check the input/output table, and get full switching capability. With one click, establish a Telnet connection for enhanced troubleshooting. View matrix switching status (input to output), DHCP on/off, power status, model, and firmware version. For SunBrite IP televisions, view IP address, Mac Address, serial number, software version, power status, current input, current channel, mute status, volume level, tuner settings, picture mode, as well as backlight, contrast, brightness, and color levels. Get enhanced integration with SnapAV amps. View device detail data such as system faults, line voltage, temperature, along with the input/output routing name and status. View version, zone name, and now-playing data. Connect remotely or soft reboot the device. View panel info, system trouble states, area status, zone status, voltage, output status, temperatures, and thermostat details. View name, model, firmware build, brightness, connection speed, and data transferred. View device name, model, build version, cast revision, time settings, and whether there is an update available. In addition, see the Wi-Fi network that it is connected to with its signal strength, along with all the other Wi-Fi networks that it can see. *These features are currently available in the local UI of the OvrC Hub only. We are actively working to get these features into OvrC. This OvrC™ product has a 2-year limited warranty. This warranty includes parts and labor repairs on all hardware components found to be defective in material or workmanship under normal conditions of use. This warranty will not apply to software services, or to products that have been abused, modified or disassembled. Products to be repaired under this warranty must be returned to SnapAV or a designated service center with prior notification and an assigned return authorization number (RA).